Statistics show that children are generally safer on the rear seat than on the front passenger's seat. Children under 12 years of age should normally travel on the rear seat 2). Children travelling on the rear seat must use a child restraint system or the seat belts provided, depending on their age, height and weight. For safety reasons, the child restraint system should be installed behind the front passenger's seat. The physical principles involved and the forces acting in a collision apply to children just as much as adults, “Forces acting in a collision”. But, unlike adults, children do not have fully developed muscle and bone structures. This means that children are subject to a greater risk of injury. To reduce this risk, children must always use special child restraint systems when travelling in the car. Use only child restraint systems which are officially approved under the European standard ECE R 44 and are suitable for the child. ECE R refers to the Economic Commission of Europe Recommendation, which categorises child restraint systems in 5 groups ⇒ page 213, “Child seat categories”. Child restraints that have been tested and approved under the ECE R 44 standard bear the ECE-R 44 test mark on the seat (the letter E in a circle with the test number below it). We recommend using child restraint systems from the range of Audi Genuine Accessories available from Audi dealers. The “Huckepack” range includes suitable restraint systems for all ages. These systems have been specially developed and tested for use in Audi vehicles and comply with the ECE-R 44 standard. Follow the manufacturer's instructions and observe any statutory requirements when installing and using child restraints ⇒ in “Important safety notes for using child safety seats”. Correct use of child safety seats can help to reduce the risk of injury in an accident. • All vehicle occupants, especially children, must wear a seat belt while the vehicle is in motion. • Children who are less than 1.5 metres tall must not wear a normal seat belt without a child restraint, as this could cause injuries to the abdominal and neck areas. • Babies and children must never travel on another occupant's lap. • A suitable child safety seat can protect your child, “Child safety seats”. • Never allow two children to occupy one child safety seat. • Never leave a child without supervision in a child safety seat. • Never allow a child to travel in the car without a suitable child restraint. 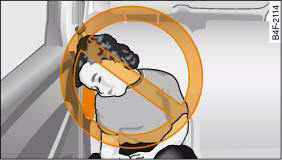 • Never allow a child to stand up or kneel on a seat while the car is moving. In an accident, the child could be catapulted through the car, causing possibly fatal injuries to itself and other occupants. • If children lean forward or are otherwise out of position when the car is moving, they are at greater risk of injury in an accident. This is particularly the case if the child is travelling on the front passenger's seat and the airbag system is triggered in an accident. There is then a risk of serious or potentially fatal injury. • To ensure proper protection, it is important to wear the seat belts in the correct position, “How to wear seat belts properly”. Always check that the belt is properly positioned according to the instructions provided by the manufacturer of the child safety seat. Incorrectly worn seat belts can give rise to injuries even in a minor collision. • Never install a rearward-facing child safety seat on the front passenger's seat if the front passenger's airbag has not been deactivated. • Extra caution is advised if you are installing a child safety seat using the same mounting bolts as the existing car seat belts. The bolts must be screwed in all the way to the full depth of the mounting holes and tightened to a torque of 50 Nm. Failure to observe this precaution could result in potentially fatal injury. We recommend having the installation performed by a qualified workshop. Whenever possible, child safety seats should always be installed on the rear seat. • Do not use a rearward-facing child safety seat on the front passenger's seat unless the front passenger's airbag has been deactivated. The child seat would be directly in the path of the airbag as it inflates, and the child could sustain serious or fatal injuries if the airbag were to be deployed. • However, if you have no alternative but to use a rearwardfacing child seat on the front passenger's seat, the front passenger's airbag must be deactivated beforehand by means of the key-operated switch*. Failure to observe this precaution could result in serious or potentially fatal injury. • Make sure that the front passenger's airbag is reactivated by means of the key-operated switch* as soon as the child seat is no longer needed on the front passenger's seat. • When using a child safety seat of the type which faces in the direction of travel, the front passenger's seat must be moved back to the rearmost position. Children must never sit too close to the opening for the side airbag. The side airbags offer increased protection in a side-on collision. In order to be effective, the side airbags need to inflate very quickly (within fractions of a second), “How the side airbags work”. The airbag inflates with such force that injury can be caused if the occupant is not sitting upright, or if there are any objects close to the opening for the side airbag. This applies particularly to children if they are travelling in a way which does not comply with the statutory safety regulations. If the side airbag were to inflate in an accident, it would strike the child on the head and most likely cause serious injury ⇒ fig. 224. 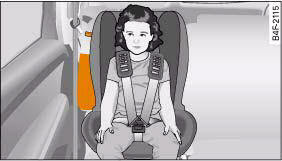 The child is correctly seated in a suitable child restraint system on the rear seat ⇒ fig. 225. There is enough space between the child and the opening for the side airbag. In an accident, the airbag would be able to inflate completely to offer maximum protection. To help prevent serious injury, children travelling in the vehicle must always be protected with a restraint system which is suited to their age, height and weight. • The child's head must always be well away from the opening for the side airbag. There is a risk of suffering injury. • Do not leave or place any objects in the space next to the side airbag. There is a risk of suffering injury. If required, you can have the side airbags for the rear passengers deactivated by a qualified workshop.